Since 1966, the steam rally event has been held in the superb grounds of Stradbally Hall, Stradbally, Co. Laois by kind permission of three generations of the Cosby family. This is considered by many to be the premier event in the calendar of steam and vintage shows throughout Ireland. It attracts a wide range of working exhibits and a huge attendance of visitors. The National Steam Rally is the annual steam and vintage event in Ireland, with over 30 steam engines giving working demonstrations. There are numerous family events including a carnival, trade stands, sheep dog demonstrations and train rides through the woodlands of the Cosby Estate. 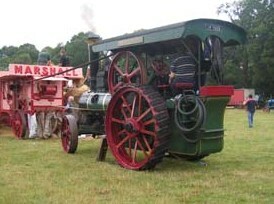 The aim of the Irish Steam Preservation Society, under which the Stradbally Steam Rally is organised, is to preserve the Irish steam heritage. It brings the past to the future by remembering steam engines with all their nostalgic glory’. Facilities include free car parking and a picnic area. Admission is €10 per adult, kids aged 12 and under are free.